Syngonium podophyllum var. typicum Engl. ↑ Govaerts, R. & Frodin, D.G. (2002). 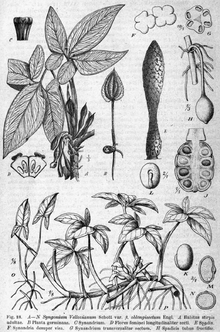 World Checklist and Bibliography of Araceae (and Acoraceae): 1-560. The Board of Trustees of the Royal Botanic Gardens, Kew. หน้านี้แก้ไขล่าสุดเมื่อวันที่ 26 ตุลาคม 2557 เวลา 09:54 น.